While this capsule description fits the “Iran deal,” that titanic political battle has eclipsed a similar case that preceded it only seven months before: the agreement to restore normal diplomatic relations between the U.S. and Cuba. And rather than any negotiation with Iran, it may be the Cuba precedent that is more clearly instructive of the political strategy accompanying Obama’s use of his executive powers in the context of divided government and acute partisan polarization in Washington. The Cuba deal exemplifies, in the incremental manner in which it was brought about, how closely attuned the Obama administration has grown to the constituencies supportive of significant policy change, as a counterweight to a formidable opposing constituency with powerful allies in Congress. In the Cuba case, this strategy was principally about the growth and evolution of the Latino vote in presidential elections. Given the ongoing rise of this electorate, there may be further implications ahead for U.S. relations with Latin America. Both cases are rooted in the unplanned response that then-Senator Obama gave when asked, in a Democratic presidential candidates’ forum, would he meet without preconditions with the heads of governments such as those in Iran and Cuba. Although the event was in 2007, the senator’s unequivocal, affirmative response created a greater challenge for his campaign in 2008 in relation to Cuba, due to the critical role the state of Florida could play in the general election. Florida, it is important to remember, is historically the stronghold of the anti-Castro Cuban American community, as well as the burial ground of Al Gore’s Democratic presidential candidacy in 2000. Florida, furthermore, was the only swing state neither Obama nor Hillary Clinton set foot in during the 2008 primaries, due to a dispute between the state and national parties over the scheduling of its election. Once the primaries were over and he had secured the nomination, Obama chose to start campaigning in Florida by doubling down on his pledge to approach Cuba in a new way, but he seized upon a relatively modest policy change as his centerpiece: to immediately lift the Bush administration’s restrictions on family travel and remittances to the island. Those restrictions were controversial among Cuban Americans, adding to a mix of changes to the political landscape in the state. In fact, by 2008, Cuban Americans only made up about one of three Florida Latinos eligible to vote, and among all Latinos Democratic registration had surpassed that of Republicans. Even that third of Florida’s Latinos who identified as Cuban American was undergoing significant changes, both generationally and due to a steady inflow of new immigrants from the island since the mid-1990s. These changes in Florida’s political demography helped Obama win both the state and the majority of its Latino vote, make substantial inroads into the Cuban American vote, and carry Miami by a landslide in 2008. The stage was set to start changing policy. In his first 100 days as president in 2009, Obama made good on his pledge and announced the lifting of restrictions on family travel and remittances to Cuba. Days later, he participated in his first Summit of the Americas gathering of hemispheric heads of state – from which Cuba continued to be excluded – and was received like a hero. The interaction between the policies Obama was instituting and political support for them deepened over time. In spite of denunciations of this rapprochement by Cuban American lawmakers in Congress, their community soon was traveling to Cuba in record numbers. And in spite of his party’s loss of control over the House in the 2010 midterm elections, Obama went further in 2011 in loosening controls on travel and remittances to Cuba by Americans without family members there. The president waited until after the 2014 midterm elections to take his third and greatest leap in relation to Cuba – the deal by which diplomatic relations would be restored, along with a package of other measures of engagement. When Congress reconvened in 2015, the old Cuba lobby was unable to mount a vote to block the island’s removal from the official U.S. list of state sponsors of terrorism. Obama’s wins this year over the two most storied, ethnically-based foreign policy lobbies in U.S. politics will be examined for some time to come, as I do in greater detail in next year’s second edition of Contemporary U.S.-Latin American Relations (edited by Jorge Dominguez and Rafael Fernandez de Castro). What is of greatest international interest are the means by which a U.S. president is able to work around a Congress that has come to oppose nearly all treaties. 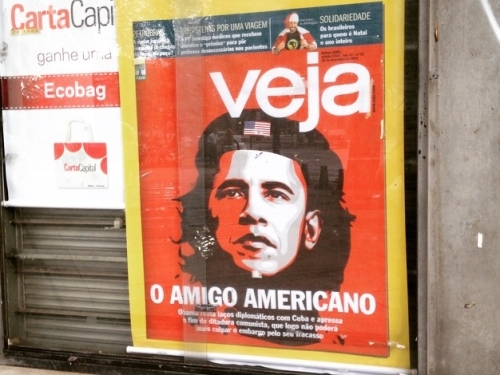 Given the relentless growth of the Latino electorate in U.S. politics, the Obama administration’s executive action strategy of policy change could have further applications in relation to Latin America in the future. David R. Ayón teaches Latina/o Politics at Loyola Marymount University, where he is Senior Fellow of the Center for the Study of Los Angeles. He is also Senior Strategist and Advisor to Latino Decisions, serves on the editorial board of Foreign Affairs Latinoamérica, and is a member of the Council on Foreign Relations.